As a mom of two, I’m all about comfort and finding clothing items I can wear while chasing my kids around. That includes a lot of boots/flats, sweaters, leggings, and pretty much anything comfortable. However, sometimes I like wearing styles a little out of the norm. For date night, I chose something edgy and was finally able to wear my new fringe jacket. 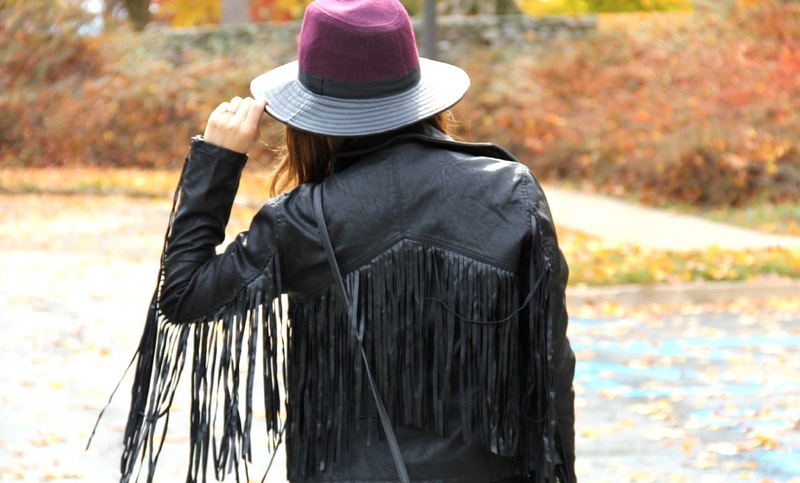 I am all about fringe this season, and this jacket is sure to make a statement. I paired this look with my new clutch from Etienne Aigner. I mean, the dalmatian print? Im in love! See below for the winner of the $500 Nordstrom Gift Card Giveaway!!! Congratulations Sara! Please check your email so I can get you your prize ASAP!! Thank you to everyone who entered, your support means the World to us! I love the fringe!! You look amazing! I hope I can look that good one day when I have kids! I love this edgier look on you! That jacket is so amazing and the booties and bag are the perfect fall accessories! I love how you show women that just because you have mommy duty doesn't mean you can't look fabulous at the same time!! Looking beautiful girl!